Manchester City. The club everyone just loves to hate. They have financial backing to sign any player they want. They have money which some clubs could only dream of having. But as this dream of challenging for trophies and having the best players becomes a reality, there is something which could stand in their way. The Uefa Financial Fair Play rules. There is absolutely no doubt Manchester City are fully aware of this too. Some argue this is an explanation as to why the club have made a massive commercial deal with Etihad. As many are aware, Man City recently announced a 10 year Stadium naming rights deal with the Abu Dhabi based company. The deal is worth around a staggering £400million. Indeed this deal looks odd and has been met with sceptism from City’s rivals. But a closer look at Man City’s main sponsors highlights even more murkier water. Below are Man City’s eight main sponsors, these can also be found on their website. The sponsors highlighted in yellow are all based in Abu –Dhabi. Now, on the surface this seems genuine. The Man City owner has every right to develop and create relations between his club and companies based in his country. However, if one takes a finer look at the sponsors in yellow, it creates a different picture, one which seems far more ingenuine. Firstly, Aabar, a global investment company which deals with buying and selling oil, is owned by the United Arab Emirates government, via subsidiary companies. While, ADTA (Abu Dhabi Tourism Authority), is yet again owned by the United Arab Emirates government. Then of course, telecoms giant, Etisalat are owned by, you know who..The United Arab Emirates government. Indeed this seems a little odd that four out of eight of Man City’s sponsors are owned by the same institution. But here’s the most resounding aspect of the sponsorship issue. The Manchester City owner Sheikh Mansour Bin Zayed Al Nahyan, is one of the Deputy Prime Ministers of the United Arab Emirates government. This rings massive alarm bells. The City owner is a key player in the governing of the United Arab Emirates. In fact, he chaired the First Gulf Bank and many other imperative faculties of the UAE government. It’s fair to say, Sheikh Mansour Bin Zayed Al Nahyan has a massive political influence in UAE. 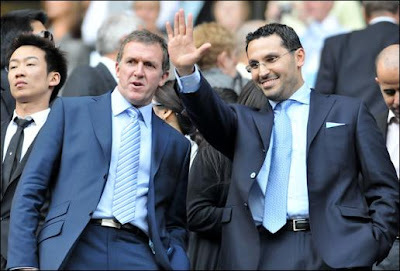 Coming back to Manchester, the owner’s political role explains vividly why four of Man City’s main sponsors are owned by the UAE government. It’s transparent that City’s bizarre sponsorship dealings have become even more broadcasted after the club’s massive new naming rights deal. The fact Etihad Airways, a company, who since its existence in 2004 has reported a loss every year has agreed to stump up £400 million over 10 years is extremely dubious. You also have to consider Etihad Airways is a third of the size of British Airways, in terms of fleets. There is no surprise that some football clubs have been muttering in frustration at City’s deal. After all, it’s clear the Manchester City Owner is in a position to dictate and have some means of control over Etihad Airways. The simple fact Sheikh Mansour Bin Zayed Al Nahyan is a man of great wealth its clear he can provide heavy backing to Ethiad Airways in order for them to facilitate dealings with Man City. This seems logical, especially since the Airline company are working at a loss. But not only this, his political influence can allow him the chance to make these types of dealings possible. With Sheikh Mansour Bin Zayed Al Nahyan great position politically and financially in Etihad Airways, Arsene Wenger is completely correct when he states, ‘It raises the real question about the credibility of Financial Fair Play.’ However, Gary Cook, the Man City Chief Executive argues the substantial stadium sponsorship deal fits under the FFP rules. One can easily see where Garry Cook is coming from. After all, the holdings of Etihad Airways isn’t directly under Sheikh Mansour Bin Zayed Al Nahyan. This means his potential influence on the business is not official or visible to the public. This is yet another reason as to why Wenger argues this deal raises serious questions of the credibility of the FFP rules. However, there is some hope for Football. The Independent revealed that Uefa’s FFP will analyse family relationships between clubs and it’s sponsors. Many have stated this is where Man City’s massive sponsorship deal with Ethiad Airways could fail. After all, the Chairmen of Ethiad Airways is Hamed bin Zayed Al Nahyan. Who incidentally is the half brother of the Man City owner. Without a doubt the personal closeness between the two supreme heads of both companies symbolises the murky waters between Man City and Etihad Airways. Surely, the FFP rules will instantly ring alarms bells when this is recognised. However, it’s transparent City have tried to overcome this family relationship problem before the FFP rules fully kick into play. The beauty of doing this deal now means that the club can commercially make money before UEFA begin to crack down and analyse clubs accounts. Making money commercially now will be a lynchpin in assisting the club to work at a profit rather than at a loss. This will help the clubs credentials for being allowed participate in Europe in the following seasons. The sad aspect of Manchester City’s massive sponsorship deal is that it foreshadows two certainties. Firstly, if Man City are allowed to exploit the FFP rules, it will be all most certain that Man City will develop or gain new sponsors (most likely from Abu Dhabi based companies) who will sponsor the club for massive amounts. Secondly, Man City, will be the litmus test for UEFA. Many owners such as Liverpool’s John Henry have argued, the FFP rules will only work if the rules are enforced properly. If teams like Man City can evade the FFP rules with their incestuous business relations, it surely is a bad sign for Football. The last thing the game needs is for the rules to be there, but for them to be exploited by the super rich. Edin Dzeko - How will he fit into Manchester City's catalog of players? Just How Good is Gary Cahill? Are some players given the captaincy for the wrong reasons? Great article - addresses what everyone else is thinking.